Custom sized to your specifications. Includes assembled rod, wall or ceiling brackets and baton. 94003 track, 20' maximum track set length, one way, 40' maximum track length two way draw. Maximum weight one way draw 40 pounds, two way draw 80 pounds. Can be used for hospital curtains track. Architrac baton draw drapery track by Kirsch. 3 feet minimum included in base price. Plus truck freight over 104". If cut for shipping is selected, choose FedEx cut for shipping method in the check out. Must be less than 104". Attached to a C-ring which can be used as a leading edge ring. Used to open and close drapes on antique drapery rods across support brackets. Zinc plated. Right Hand for pinch pleats and 9670 master carriers for hidden batons. For pinch pleat or Ripplefold systems for 94003, 94004 and 94008 drapery tracks. This curtain rod is designed to commercial quality specifications demanded by hospitals, hotels and other commercial buildings where high traffic and abusive use is prevalent. Yet, it's sleek 3/4" x 1" profiles blends into any home decor with ease. 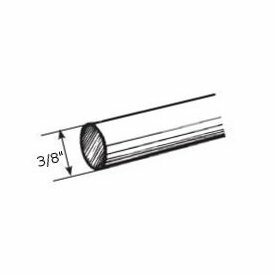 For long drapery rods wider than 20 feet, you can use splice #94110 to extend as long as necessary. Minimum 12 feet. Baton draw, ceiling or wall mount. For pinch pleat or ripple fold drapery systems.